The Alfred Wegener Institute's Polarstern research icebreaker plans to freeze itself into Arctic sea ice for the winter, following Fridtjof Nansen's path, on a research mission. In 1893, Fridtjof Nansen set out on one of the great expeditions in world history, deliberately trapping his ship in the ice to drift across the Arctic. Loaded with provisions for five years and a crew of 13, the Fram traveled for three years, and while it never reached the North Pole, the ship made it across the ice intact. An international team hopes to begin repeating a portion of Nansen’s journey in the Arctic this October aboard a German icebreaker that is to remain icebound for a year. 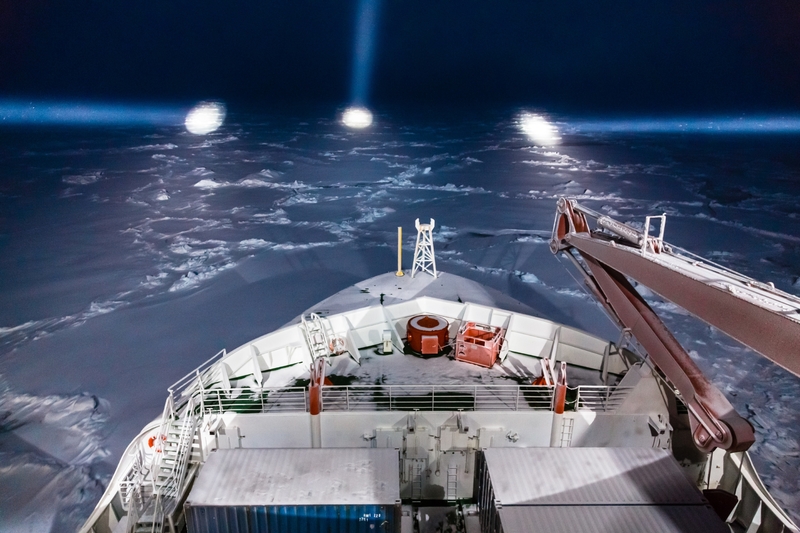 “We will take the Polarstern into the ice and let it freeze in,” said Matthew Shupe, a researcher scientist at the University of Colorado. Germany and the U.S. are the major contributors on what will be the largest experiment ever in the central Arctic Ocean. Shupe calls himself the “chief motivator” of a project that has taken a decade to develop and now includes the involvement of 60 institutes from 17 nations. He said most of his professional life over the last 10 years has been centered on arranging this expedition. The idea began to take shape in 2008 when he was on a Swedish icebreaker near the North Pole. “I thought that the measurements we were making at that time were simply too short in duration to really understand what was happening with the sea ice,” he said. It happened that Klaus Dethloff from the Alfred Wegener Institute in Germany had similar research in mind and became a partner in building international support. The Polarstern is the flagship of the institute, and while it is capable of using its engines to break through 1.5 meters of ice, about five feet, the idea is to go with the Arctic flow, about 7 kilometers per day. The Polarstern will serve as floating hotel and laboratory, with research facilities both onboard and on the ice, for the collection of data about the interaction of the sea, ice and atmosphere. The crew will search for a large, older ice floe that is at least 1.5 meters thick, with a diameter of several kilometers. Staying with the same ice for a year will show how it evolves over that time and provide information about the transfer of energy from the atmosphere and the ocean — keys to understanding the entire system. The official name of the venture is the Multidisciplinary drifting Observatory for the Study or Arctic Climate or MOSAIC, for short. About 100 people will be aboard the ship at a time, with about 50 crew members and 50 scientists, he said. “We’ll sleep and eat on the ship, that’s our home base, but we will have some day-to-day operations on the sea ice,” he said. They will drill holes in the ice for ocean research and collect atmospheric data from towers on the ice and snow. The year is to be broken up into a half-dozen two-month legs, with personnel rotating in and out via icebreakers and aircraft. About 600 people are expected over the course of the year, with about 300 others working in the background. “I’m not aware of anyone that will stay for the full year, but there are a number of people that will participate in about half the year,” he said. He said he would like to spend the year on the ocean, but he doesn’t want to abandon his family. The logistics are complicated, to say the least. The Germans have made a $30 million commitment. “We will have to support that vessel with food and fuel and we need to move people back and forth,” he said. Two Russian icebreakers, one Swedish icebreaker and one Chinese icebreaker are expected to be the resupply ships. A landing strip will also be made on the ice. The ship is to begin its drift in the Central Arctic, starting in the sea ice off Russia’s coast, and plans to end in the Fram Strait between Greenland and Svalbard. The will be north of the 80th parallel for the year and close to the North Pole for much of the trip. The choice of the starting point is about as far from land as possible, but “if you choose another location, you’ll eventually get spit out of the ice or melted out of the ice and we’d prefer that not to happen,” he said. By the end of the year, the ship and the ice are expected to have traveled about 2,500 kilometers or 1,500 miles.